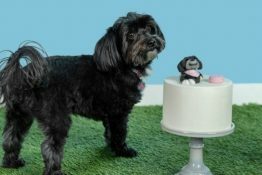 New Toys R Us Pets Collection at PetSmart Product Review + Giveaway!!! Toys R Us Pets Patterned Body Canvas Caterpillar: This toy has 5 squeakers for extra fun! Remember to always supervise dogs with squeaker toys…Daisy and I enjoy playing fetch and a light game of tug with this one! Toys R Us Pets Wacky Water Bottle Crunchers: You know how dogs love to play with empty water bottles? Well, Daisy sure does! This cute toy covers the water bottle so that a pup can enjoy the crunchy sound and fun, without you having to worry about them hurting their mouth or swallowing pieces of broken plastic if they crack the bottle! Toys R Us Pets Rope Tug Animal Dog Toys: This colorful and fun toy is great for tug, fetch and as a light chew toy. Daisy always loves rope toys and this one was no exception! 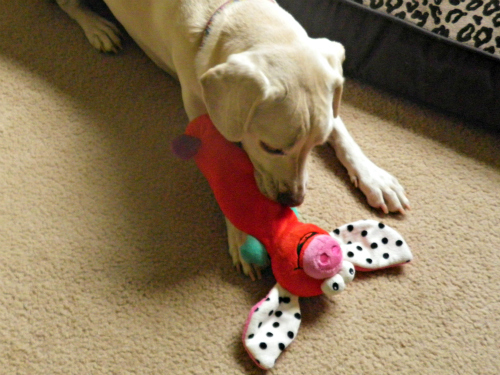 You can also see her in action during our K9 Kamp Week 3 Highlights where this toy is featured in one of our Doggone Minute To Win It activities! 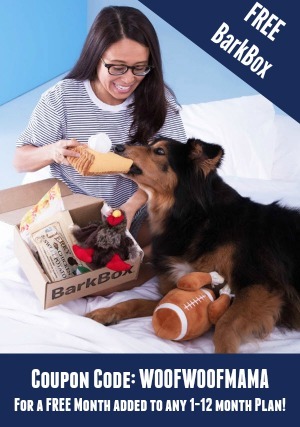 You can browse the Toys R Us Pets Collection at PetSmart.com or your local store and discover more colorful and fun dog toys for pups of all ages and personalities! 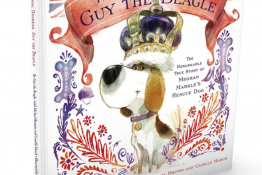 Remember to use the 15% Off PetSmart Printable Coupon I posted recently! It’s good for your entire in-store or online purchase June 7-10! 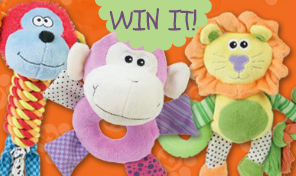 To launch this new collection, PetSmart is giving away a Trio of Toys R Us Pets Dog Toys to one Lucky Reader! 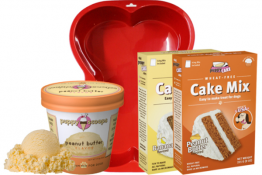 This giveaway runs thru June 19, 2012, is open to US residents age 18+ and uses the Rafflecopter Widget for FAST and EASY ENTRY! There are multiple entry methods to give you additional chances to win, but just choose the ones you want. Email addresses and other info are only used to verify and contact the winner. Rest assured that your information will never be sold or shared with anyone. All entry methods are subject to verification. Please make sure you provide all required information or your entries won’t count! 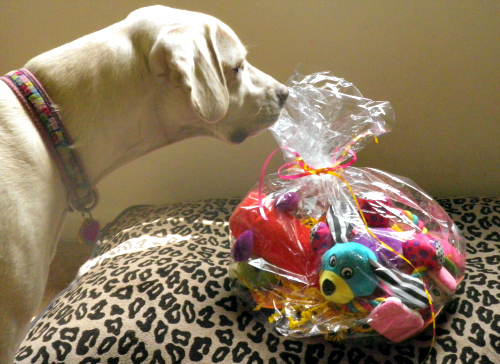 Disclosure: Daisy received toys so that we could tell you about them and let you know what we think. All opinions are 100% our own! Prize Sponsor will ship directly to winner and while we will do our best to assist, we cannot assume responsibility for lost or undelivered prizes. By far, Paddy’s favorite game is fetch– doesn’t matter what she is fetching (tennis ball, stuffed toy, etc), she’ll play the game for hours on end! My dog loves to tug, toss and chew!! Cooper (our 3 month-old Cav King Charles) LOVES to play fetch and already knows how to retrieve and “leave it” (I’m quite the proud mama.)! My dog Kouga likes chew toys and Artie likes squeaky toys. 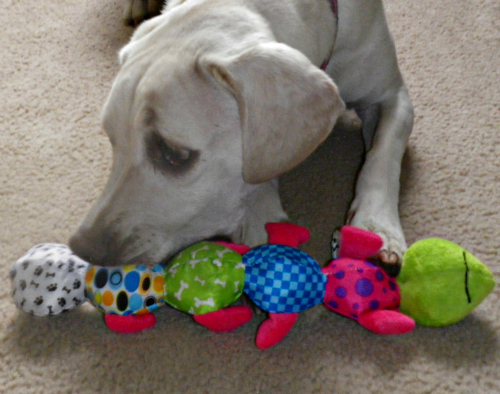 My pups favorite game is fetch, these colorful toys would be the perfect addition to his fetch pile. My Blue dog is all about the ball. Mr. Buster loves to play tug! He also takes his squeaky toys, rolls over on his back, then squeeks them while shaking his entire body! OMD! How cute are those toys. I so hope Coco gets a chance to play with them. 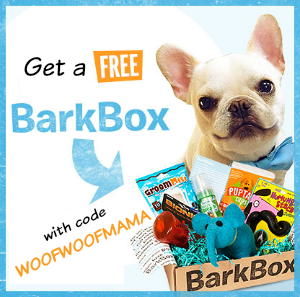 That for another great giveaway Woof Woof Mama. Our St. Bernard puppy loves to chew, squeak and tug. Our dog loves stuffed toys, but only until the stuffing is out. my oldest girl loves to play ball, any type, any size….we play kickball and soccer….she jumps up and blocks the ball, she dribbles the ball in the yard and all over the house…. the 2 younger girls, love squeaky toys….the baby, tears up the toys so fast, only 1.7 mos old and has already destroyed over 15 toys….she tears the stuffing out, then the squeakers….some toys only last a few hours…. the middle child loves little squeaky toys that she can carry in her mouth. Tiny my puggle loves toys that he can just gnaw at. He always rips off the toys’ ears and tries to get to the stuffing inside! My dogs love stuffed toys that have squeakers. Artie likes the toys you can put a water bottle into and it squeaks and crunches. my boys love nylabone and fuzzy stuffed squeak toys. those silly grunting hedgehogs are a favorite. My 2 dogs love to play tug of war with their friends at the dog park. My dog Pepper loves ‘fetch’ the most. We go out back and throw the ball and she loves it! Keeps her healthy and happy. My Ceaser love to play with any toy as long as he can fit it in his mouth !!! My dogs like anything that has a squeaker and float in the pool. Mac loves to play tug of war all day long if you let him. My dog likes chew toys. I like toys that he can’t chew up in 30 seconds! 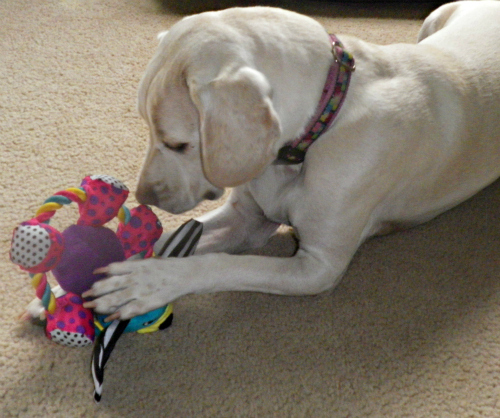 Paige’s favorite game is “fetch,” and she loves bright, colorful toys. Thanks for making this opportunity available. My pug loves stuffed toys. He carries them around the house, greets us at the door with them, and snuggled with them. Max loves any kind of chew toy! My dog Lucy loves to play tug, toss and fetch, but they have to be soft toys. my dog Geisha loves to chew and fetch! Riley is a pup still, so his favorite game is “chew on anything I can”…. My dog kai loves playing catch with the rubber tires. My Australian Shepherd really only loves toys that squeak. If they don’t squeak she drops them and moves on to the next toy in her toy basket. My dog loves bones the most! Thank you! my dog loves to tug and fetch! Chasing sticks and the ball too. He loves fetch but dosent like to bring it back he just runs with it! Our dog loves to chase laser pointers around the house and yard. Thank you for the lovely giveaway! My little girl loves squeek toys. My new dog Max(Shadow) loves anything that flies..frisbees, balls, Kongs..lol. He is a German Shepherd with a very high energy level! Max also can devour a rawhide bone in under one minute which i think must be a record in dogdom!! One loves toys that squeak, the other loves tug toys. My dogs love rope toys. I have 13 chi’s & 3 rotties!!! They LOVE any type of toys. I am a chi breeder and i love my rotties with all my heart! My two boys love their raw hide bones. I have a wonderful American Eskimo dog, and she just LOVES the toys that are empty and you can put empty water bottles in. She loves the noise it makes when she bites it, she just loves everything about those toys! Her other favorite toy is a really simple one. Stuffed ducks. I really have no idea why she loves stuffed ducks so much, but you can put a pile of toys in front of her and she will always pick the duck out of them! I have 2 Schnauzers who loves to play tug of war with their toys so the would love the caterpillar. My dog loves her treat ball! My dog loves to cuddle with his bear and chew his bone. Bo loves it all. He loves to chew and toss stuffed animals around. My one dog love to chase the ball, while the other one loves to play tug. Thanks!! My dog loves any type of toy with filling hehehe so he can try to chew it out!